George Robertson breathes fire at the 21st Street Co-Op on Monday night. Gwam Puerta, 21st Street Co-Op “fire senpai,” and his group of friends perform fire shows at parties and special events hosted by the Co-Op. 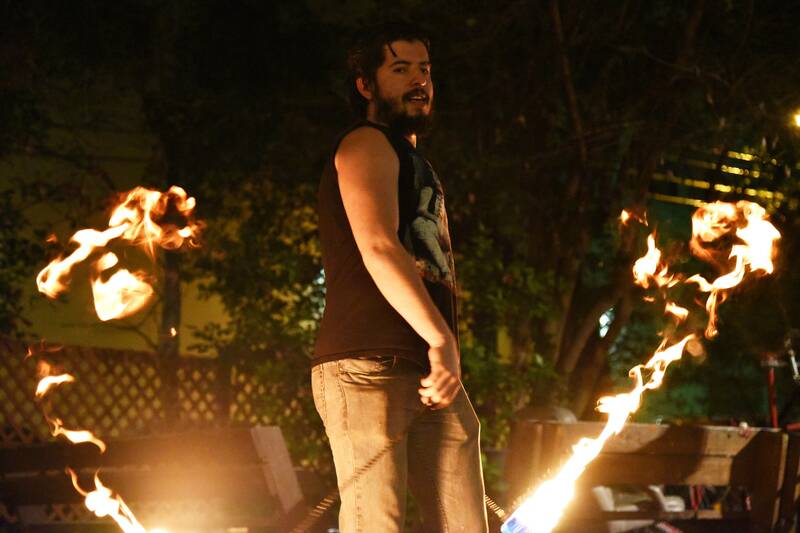 Puerta is one of many students in a community of fire spinners, a form of flow art — or the practice of manipulating various props, such as staffs, hula-hoops and poi balls attached to the artist by a chain or string. Some artists practice with LED equipment, producing light shows with their movements, while others, like Puerta, spin, throw and breathe fire. Puerta learned to spin fire three years ago at the 21st Street Co-Op, when a friend taught him some basic moves in a crash course. He said flow art helped him relieve stress, and he would often practice during study breaks. Over time, his moves became muscle memory, and he was able to practice with live flames. He and a group of friends started performing at parties and special events hosted by the Co-Op. “It sounds scary at first, but once you get over [that fear], you’re safe,” Puerta said. Today, Puerta is the 21st Street Co-Op fire master — more colloquially known as the fire senpai — and puts on the community’s fire shows, ensuring they run smoothly. He has also taught over 20 students at the Co-Op moves ranging from the butterfly, a move in which two poi are used to create the image of a butterfly’s wings, to more intricate ones, such as the three-beaded-weave, which produces two full circles of flames on each side of the performer’s body. Puerta taught UT alumna Alex Colella when she was living in the Co-Op last semester. Colella said it took her a month to feel comfortable graduating from her practice equipment, a sock stuffed with tennis balls, to a flaming poi. Neither Colella or Puerta have seen a flow artist seriously injured during a performance. In order to maintain this level of safety, one person, whom they call the firefly, manages the fire-extinguishing equipment in case of emergency. ­­­Colella said the scariest part of spinning is the deafening sound of the poi, whizzing by her ears as she spins. The flow art scene expands beyond the UT campus. Colella is a member of Austin Flow Jam, a local community of over 800 artists who gather each Tuesday on the State Capital grounds. Co-creator Kira Bolin helped start the group with her boyfriend in June 2014 in an attempt to bring together a flow art community. Since then, the group has grown rapidly. Kat Massock, a member of the Austin Flow Jam, specializes in LED hula-hoops, which change colors with movement and can create over 300 different patterns. Massock said she is participating in a few flow art performances in the upcoming South by Southwest Music Festival, including an in-costume flash mob. Bolin said flow art has helped develop a community of like-minded people within Austin and helped her grow, personally, too.